If you lived out your pre-teen and teen years during the late 80s to mid 90s, then the game R-Type probably brings back fond memories of many hours spent during the summer holidays at the local arcade. Yes...I know I’m dating myself. You’d likely recount the bags of quarters you wasted trying to beat the game. It was definitely one of the more challenging shooter games out at that time. But as frustrating and challenging as the game was, it was FUN. So now we zoom into the present. 2009. You’re thinking “hey...I would love to play some classic R-Type 'cause that was an awesome game”. Well now you can. For 1600 Microsoft points, you can download R-Type Dimensions from Xbox LIVE. 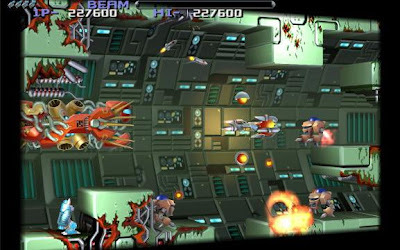 R-Type Dimensions is an offering of both the classic shooters R-Type and R-Type II. Both games have also now been given an updated visual treatment with 3D elements while still retaining the traditional 2D side scrolling game play. A multiplayer component is included to provide co-op play and additional replay value. If you’ve ever played R-Type before, then picking up the game is literally a breeze (honestly...it should be even if you haven’t played it before). You use the analog stick to manoeuvre the R-9a fighter spaceship. Keeping your forefinger pressed firmly against the RT trigger will activate the continuous rapid fire while the A button allows you to fire shots as needed or if held down will activate a more powerful blast with varying degree of power (defined by a meter at the top that builds up until you let go of the A button). Overall gameplay is smooth and responsive – no surprises here. The real challenge with this game is ensuring that you make full use of the game screen and keep moving your fighter strategically to avoid enemy fire and get good positioning to take out enemies. If you stay too stationary, you’ll end up using a number of continues. For those who want a lesser challenge, or who have no patience to master the game, there is an “infinite” mode that provides you with endless lives. No matter how many times your fighter is destroyed, you’ll keep spawning a new fighter until you finish the game or you decide to exit it. Visually you can tap either the RB trigger or Y button to switch between the classic 2D and the 3D visuals. It’s actually an interesting feature as I found myself switching between both visuals at various times because it seemed easier to focus on the onslaught of enemies and projectiles filling up the screen in the 2D graphics and at other times in the 3D graphics. There is also an option in the video settings to switch the 3D camera from normal mode to “crazy” mode. In this mode, the 3D graphics are presented from an angled ¾ perspective. Oddly enough, all the enemies still retain a flat 2D perspective which after a while makes things look very inconsistent and becomes somewhat annoying. The audio in both games are as classic and fantastic as you’d expect. Great old arcade style synthesized music and sound effects. Thankfully they stuck with this simple but engaging formula for sound because anything else would have been inconceivable. Multiplayer was one of the new features that I didn’t have a great opportunity to test out because I could not find any matches online (not surprised as I didn’t expect many people to have purchased this game as of yet). C’mon R-Type fans...get online. 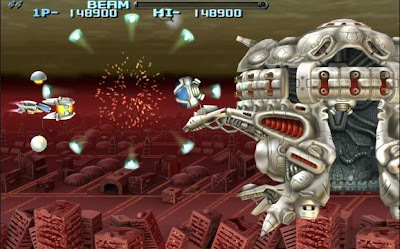 In the end, R-Type Dimensions is a wonderful package. 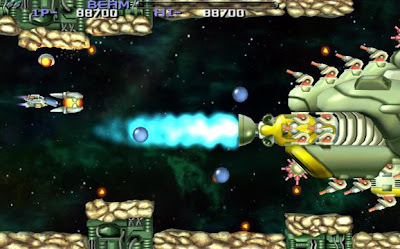 Two classic R-Type games presented in either 2D or 3D graphics, great arcade style audio, easy to pick up and play controls, new features such as the “crazy” 3D camera mode and “infinite” play mode and the presence of multiplayer modes. All in all, this package is definitely worth the 1600 Microsoft points as it will no doubt give fans of the series as well as those new to it a great throw back arcade experience.